The Nintendo Entertainment System’s massive popularity led to a licensing gold rush in the late ’80s and early ’90s. It seems like every property under the sun was shoehorned into a video game, regardless of whether that property lent itself to a game format or not. Sometimes we got games that seemed like no-brainers for the format, like Friday the 13th or Nightmare on Elm Street, but were lazily developed cash grabs. Other games, like Bill and Ted’s Excellent Adventure, showed glimmers of big ideas but unsatisfying executions. These failures all made sense, though – these were big properties of the time and of course someone would try to make a buck off of a video game version. 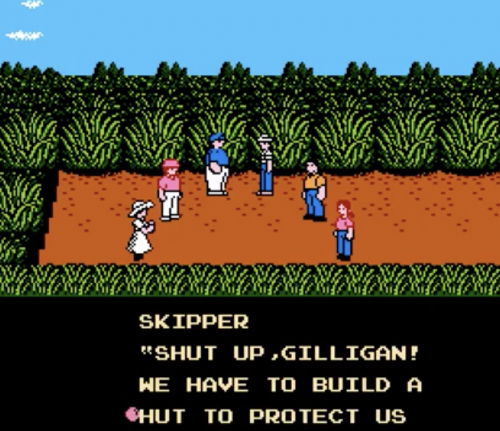 Then there are head-scratchers like this one: The Adventures of Gilligan’s Island, the Gilligan video game that nobody asked for. 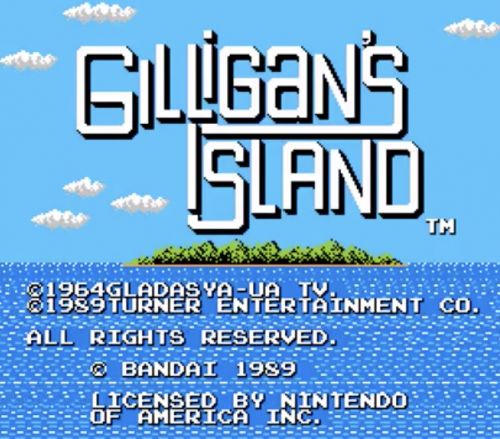 It’s difficult to tell if this game was developed by someone who’s completely unfamiliar with Gilligan’s Island or if it was developed by someone who knows the franchise but also knows enough to know it doesn’t matter. The game resembles Gilligan’s Island enough to pass muster, but falls short on some pretty big fronts. For one, there’s no Ginger anywhere. That’s a pretty big whiff, right? The game breaks its story into four ‘episodes’, more-or-less serialized arcs that tell the story of a magic idol that can grant wishes. It’s really just a bunch of fetch quests that have Gilligan and Skipper (the player) ping-ponging between the Professor, The Howells, and Mary Ann through a repetitive platform landscape. I’ll spoil the ending for you: the castaways retrieve the magic idol which will grant them one wish. 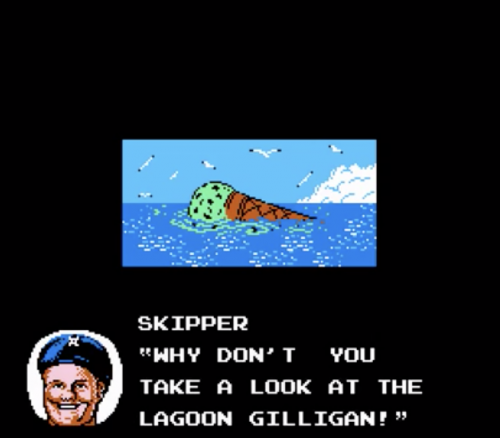 Just as they prepare their wish to get off of the island, Gilligan wishes he had some ice cream. What! I’m bagging on this game because it’s a terrible game, but I’m still fascinated by the “how” of it. This speaks to a time when the filter was wide open for licensed products of all shapes and sizes, and that wide filter generated a lot of garbage that landed in the laps of a generation and became an unavoidable part of the experience of being a kid. Combine this with the sharp uptick in the amount and variety of media consumption available to that generation and stuff like this sticks to history a little bit more than maybe it should or would in a different time, before or after.